Research Associate Greg Hannsgen is a macroeconomist and monetary economist. He is a member of the Institute’s Economic Policy for the 21st Century research group. In addition, his work alone and with other scholars has appeared in Levy one-pagers, public policy briefs, and working papers, as well as the journals Challenge, International Review of Applied Economics, Journal of Post Keynesian Economics, Journal of Socio-Economics, Metroeconomica, Review of Political Economy, and Social Security Bulletin, and in several edited volumes. Hannsgen’s views and research he has been involved in have been featured or discussed in such outlets as asymptosis.com, the Atlantic, the Financial Times, Kiplingers.com, the Los Angeles Times, and his blog site, greghannsgen.org. An article of his on the role of homes, mortgages, and home-equity loans in the economy was recently reprinted in the multivolume set Housing Economics, from SAGE Publications. 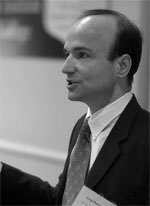 Hannsgen studied economics at the University of Notre Dame, leading to an MA in 1997 and a Ph.D. in 2002. He also holds a BA in economics from Swarthmore College and an MA in public affairs from the Hubert H. Humphrey Institute of Public Affairs at the University of Minnesota (renamed the Humphrey School of Public Affairs in 2011). Hannsgen joined the Levy Institute in 2002 and was appointed research scholar in 2006.